An ambitious project is set to bring the Western Isles' rich history back to life. `Hebridean Connections - People and Place' project is a joint initiative aimed at making the area's diverse cultural and historical past available to everyone, everywhere. 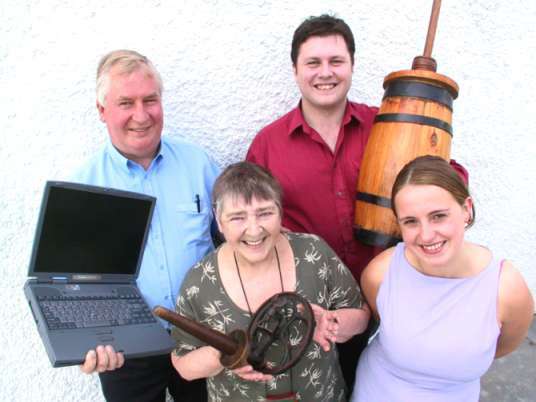 Four Lewis-based historical societies, Bernera, Uig, Park and Kinloch are working in partnership to achieve - among other things - the creation of a data search service for those wanting to trace their roots. The project will create area specific social and family archives through various means including sound recordings, stories and songs, photographs, village histories, cemetery records, etc. This information will be enhanced by the inclusion of supporting information on archaeology, geography, social history, folklore and local knowledge. People anywhere in the world, interested in finding out more about their Hebridean ancestry, will be able to access the `Hebridean Connections' database and search the vast amount of information collected by the four historical societies over the years. The project will develop a user friendly computerised interface which, when tried and tested, will be available to other historical societies. This will allow users to look at a map of a local village, identify a particular croft and `zoom' in. There, the user will be able to find out who lived there, see photographs of people and listen to sound recordings of stories about their lives. The Bernera Historical Society is leading the project. Their chairman, Calum John Maciver said: "As well as sharing and collecting all our information and putting elements of it on-line, we plan to create interactive displays at the four historical society museums, which will also be accessible via the internet. "We also plan to link the databases to schools, colleges and universities so they can use the information for projects or research. "The success of the project of course will build on the of goodwill, local knowledge and volunteer effort, which has already been expended in each historical society over the years." The Societies have raised over £15,300 themselves to help pay for `Hebridean Connections'. The £70,800 project is also receiving support from Western Isles Enterprise (WIE) with a grant worth £7,500 and further financial assistance is coming from the Heritage Lottery Fund (£58,000) and Comhairle Nan Eilean Siar (£20,000). Funding from public agencies is for the first three years of the project but John Murdo MacDonald of Kinloch Historical Society says the project should create an economic base through the creation of new products and services. "Basic elements of the `Hebridean Connections' database project will be available free of charge but further,more specific information can be provided on a charged basis and we will be able to compile CD-roms for customers" he said. `Hebridean Connections' is set to create five full-time jobs with a member of staff based in each of the participating historical societies, in addition to a co-ordinating project manager. Chief executive of WIE, Donnie Macaulay said: "One of our priorities is to enhance the quality of our environment and culture and the `Hebridean Connections' project will help meet this objective. However, this initiative is not just significant for its contribution to our culture, heritage and environment. Five new jobs are extremely important in these areas, which have experienced depopulation in recent years. Some of the jobs will be based in the economically fragile Iomairt aig an Oir (Initiative at the Edge) areas." "Historical societies have for many years made a valuable contribution to the areas they serve. We welcome the introduction of new technologies to open up their important archives to the wider world."